“Late-night” is a complicated and often confusing term in television studies. As television in the post-network era has increasingly catered to fragmented and time-shifted viewing practices, late-night programming has dramatically shifted both aesthetically and industrially. Despite these supposed advancements, though, the genre continues to lag in its representation onscreen. Broadcast networks still exclusively have white male hosts. Cable channels and streaming services have become the outlets through which “experimentation” (read: deviation from the genre’s racial and gendered norms) occurs. Women are noticeably more present on non-broadcast late-night, but their programs are constantly qualified as niche or uncharacteristic of mainstream viewing interests. 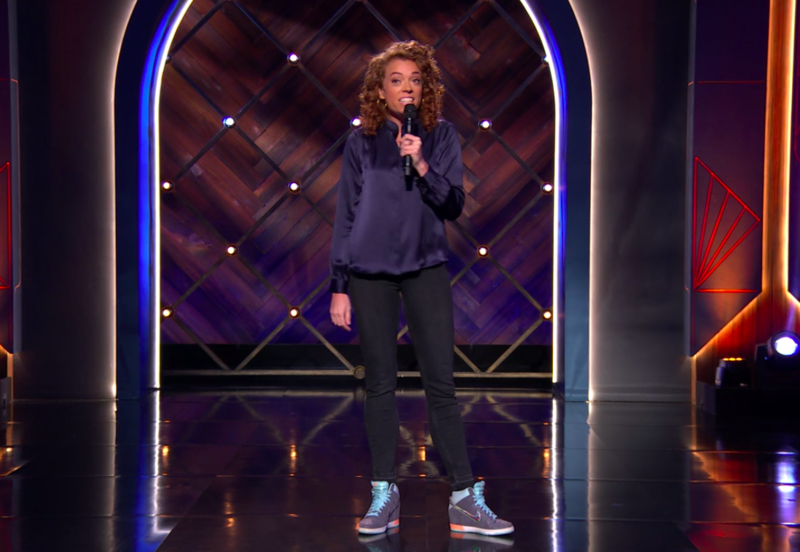 In just the last year, Hulu launched I Love You, America with Sarah Silverman; BET debuted The Rundown with Robin Thede; and Netflix launched The Break with Michelle Wolf. Before that, TBS’s Full Frontal with Samantha Bee was the only late-night program hosted by a woman. While women are certainly not new to the late-night scene, their history has frequently been marked by deliberately sexist decision-making and rhetoric that re-articulates larger gendered dimensions in the comedy landscape. For instance, Joan Rivers was passed over for The Tonight Show despite her qualifications and ratings success as the permanent guest host for Johnny Carson – this largely stemmed from Carson’s almighty authority with NBC and the perception of an “unruly woman” such as Rivers being unfit for broadcast audiences. More contemporary examples of women on late-night paint female comics’ transition to the nighttime genre as failures, with black women often bearing an exceptional burden: Wanda Sykes had a short-lived hour-long series on Fox followed by a short-lived sitcom on the same network; Whoopi Goldberg had a 30-minute series in syndication that lasted for just over a year; and Mo’Nique had an hour-long talk-show on BET that was cancelled within a year of its premiere. These industrial “experiments” outside of the norm and their quick cancellations perpetuated historical notions of the expected late-night audience (white men) and further validated (however irrationally) the historical placement of women’s programming in the daytime. The recent female forays into late-night programming are significant because they push back on numerous assumptions and accepted norms within the genre. They are each aesthetically and stylistically experimental, which is inherently linked to their unique industrial positioning on their respective channels and services. Notably, late-night television is no longer assumed to be a pure promotional vehicle as its broadcast exemplars still often showcase. Instead, the genre is now, first and foremost, a form of political satire and commentary, with women often at the forefront of those shifts. Stephen Colbert’s move to CBS signaled the genre’s more politically skewed bent, and Samantha Bee’s series doubled down by formatting each episode as an extended political dialogue about the week’s current events (undoubtedly influenced by her time as a correspondent on The Daily Show with Jon Stewart). Her series is more vulgar and has drawn considerable controversy, an issue that has similarly struck comediennes like Michelle Wolf at the 2018 Correspondents Dinner. Bee’s program eschews the traditional late-night desk in favor of a monologue-heavy style that often feels like a plea with audiences at home in contrast to traditional late-night fare. This has been popularized on other cable channels like HBO, where John Oliver’s weekly series has the host delivering news almost exclusively from a desk. Oliver’s program aesthetically links to news broadcasts (inspired by his time working with Jon Stewart), whereas Bee and Wolf’s programs visually associate themselves with stand-up, a historically maligned genre. Late-night television looks considerably different on streaming services, with Wolf and Sarah Silverman acting as strong examples. Wolf’s series, as mentioned, aesthetically emulates a stand-up routine on multiple occasions. Each episode begins with the comedienne walking up to the camera and delivering a few one-liners before moving into the seemingly traditional late-night monologue. Wolf is the only late-night host to wield a microphone, an action that formally connects her monologue to stand-up. The connection does not end there, though. The director and cinematographer both capture wider angles that show Wolf’s full body maneuvering around the stage, much like a stand-up special’s visual style. This distinguishes the series visually from its other late-night counterparts, which generally cut off the monologist a little below the waist. While only a minor change, this aesthetic link is a visual marker that generally only emerges when stand-up comics perform at the end of various late-night episodes. Both Wolf and Silverman also switch up the dynamics of the celebrity interview that usually occupies much of late-night’s format. Late-night has historically been rigidly segmented in structure: an opening monologue; then, a desk segment or two; finally, multiple celebrity interviews and a musical or stand-up performance to close out the program. Both of these comediennes place their “interviews” at the end of each episode, most notably mirroring the satirical series The Daily Show and The Colbert Report. However, the visual dynamics are much different. For Wolf, she either stands with her celebrity guest and engages in a visual stunt/prepared exchange, or she sits on a couch and delivers a scripted exchange with a fellow comic like Neal Brennan or Seth Meyers. Silverman, meanwhile, always sits on a couch for her interviews, asks guided questions, and occasionally crosses her legs or makes other visually informal decisions that are fitting for casual couch conversations at home. These are striking because these women are not reserving themselves to the desk as practically every other male late-night host does (Jimmy Fallon is a notable exception, although his celebrity interviews generally start at the desk before moving into his sketches or gags). This is only a small showcase for how female comics frequently re-negotiate the visual spaces afforded to them that have long been dictated by masculine practices and dynamics. Despite more vulgarity and expressive openness from these women, not all women hosting late-night programs are aiming to be subversive. Busy Philipps, who recently received a series order for a late-night series on E! called Busy Tonight, points out that once-a-week late-night shows are usually “more politically bent.”  Her series, though, will be more entertainment and pop-culture focused, and she hopes that her series will air multiple nights a week to alleviate that political burden that some series face. This rhetoric falls in line with E!’s branding and harkens back to Chelsea Handler’s time on the channel before her shift to Netflix. Handler’s short-lived run on the streaming service is remarkable on two fronts: (1) Netflix’s current strategy to mass-produce content and rarely cancel programs means that the series was an industrial failure for the service, and (2) the series’ focus on celebrity interviews and promotion demonstrates how that formula does not easily translate to non-commercial services and their respective programming strategies. The temporality of late-night television is also an understudied area, and one that has seen considerable shifts just within the last year. Handler’s aforementioned Netflix series shifted from thirty to sixty minutes in its second season in an effort to cut down costs and decrease the number of episodes each week. Meanwhile, all of the currently airing female-hosted late-night series are half-hours, while the broadcast networks have hour-long slots for each of their hosts. In an interview with Vulture, Conan O’Brien (who has resided on TBS since 2011 after working on NBC’s late-night programming for almost two decades) commented on his series’ upcoming shift to the half-hour format by articulating that the change could shock him into coming up with new material. Importantly, his shift is not an industrial imperative but rather a creative spark; for most women aiming to host late-night, they are not afforded the privilege of changing their time slots in hopes of inspiring creativity. Full Frontal executive producer Jo Miller says that she would “kill” to have just a few more minutes in each episode, but she knows that is unlikely. Female hosts also struggle with diversity in on- and off-screen representation, a problem Robin Thede pointed out despite BET allowing her to make the show she wanted to make. The Rundown‘s recent cancellation further exemplifies how difficult it can be for women of color to receive the trust and time needed for a late-night series to prosper. As broadcast networks increasingly move their content to online platforms like CBS All-Access or NBCUniversal’s now-defunct Seeso, the late-night format will likely continue to see considerable aesthetic and formal changes that complicate our previous understandings of the genre. This industrial trend and the concurrent movement toward more inclusive representation onscreen might signify a genre-altering shift in late-night, one hopefully led by all women. 1. Full Frontal with Samantha Bee‘s take on late-night.